Pleats Please is a collection of clothes that are a product in themselves, made with a unique "garment pleating" technique where the materials are developed from a single thread and pleats are added after sewing the clothes into shape. 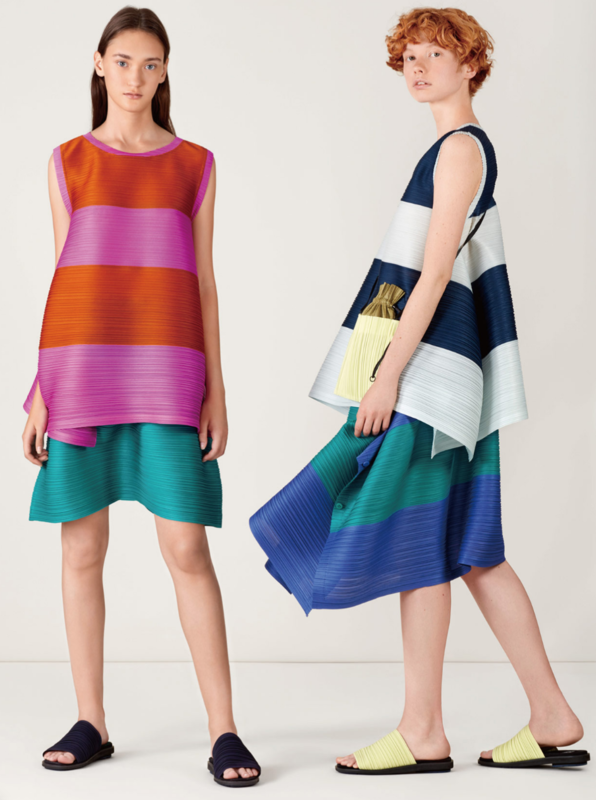 First launched in the ISSEY MIYAKE line in 1989, this pleats line grew until it finally became a brand of its own with the launch of the SPRING SUMMER 1994 collection. ISSEY MIYAKE's first collection was launched in New York in 1971, and began to be shown in Paris Fashion Week from AUTUMN WINTER 1973. From the very beginning to this day, Issey Miyake's design has focused on the concept of "a piece of cloth." ISSEY MIYAKE broke the boundaries between East and West and pursued "the body, the fabric covering it and a comfortable relationship between the two" as a fundamental concept, both shocking and resonating with people the world over. ISSEY MIYAKE has grown to include a vast number of creative personnel and innovative new techniques, but its core design style - creating clothes from original materials starting with the research of a single thread - has transcended generations. The brand has been led by designer Yoshiyuki Miyamae and his team since the SPRING SUMMER 2012 collection. The team continues to create innovative clothes that combine Japan’s technological strength with new contemporary technology.